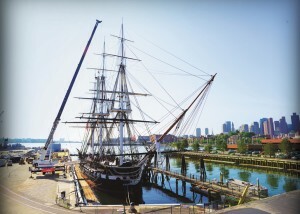 A Link-Belt RTC-80130 Series II rough terrain crane has been introduced to its operator and crew for the rigging peculiarities of the USS Constitution, a very old and stately vessel located in the Charlestown Navy Yard of the Boston National Historic Park. The 130-ton capacity RT is being put to the test by the Naval History and Heritage Command (NHHC) Detachment Boston and their work on the USS Constitution as they ready the ship for dry dock refurbishment that will begin early this year. The USS Constitution, America’s Ship of State, is the oldest commissioned naval vessel afloat in the world and is part of Boston’s Freedom Trail, which links Revolutionary War and other historic sites together to present the early history of Boston and the founding of the United States. The crane constantly moves guns on and off the decks of the ship and from the ship’s holding area below deck. The crane also moves and lifts yards, masts, generators and all types of material including chains, rigging and a personnel platform. In late August 2014, Detachment Boston used the RTC-80130 Series II to place three main sails on the frigate which included the mizzen topsail, the fore topsail and the main topsail. The main topsail is more than 80 feet long at the head, weighs 1,200 pounds, and like the other two topsails, is hoisted aloft to the yard by the RTC-80130 Series II and then “bent-on” by the ship’s crew. When set (opened up), the main topsail is 3,366 square feet – approximately the size of a regulation basketball court. Throughout the day, operator Jon Stolarski and the rigging crew must take into account the rise and fall of the tide every six hours in Boston Harbor. The tide can shift as much as 12 feet or more. Winds also affect the movement of the ship; the north wind pushes the ship out from its lines, while the south wind pushes the ship against its camel (flotation device used to raise the buoyancy of the ship) and pier. Stolarski slowly lowered the sail to waiting Navy personnel and rigging crew about 104 feet above deck, and maintained the hooked load while the sailors spread the sail in unison. The RTC-80130 Series II works at a 50-foot radius during the lifts, and between a 60 and 70 degree boom angle to lift the sails into place. The operator’s cab is angled up as high as it can go to get a better view of the sails and rigging that are then lowered to the sailors waiting on the respective yard to pull and secure it tight. According to Milt Ryan, director of NHHC Boston Detachment, the new crane needed to be rigged with 165 feet of boom height to go up and over the USS Constitution’s shroud and rigging, even at high tide. Shrouds are the ladder-like standing rigging which supports the masts. While in dry dock, the copper sheathing on the USS Constitution’s lower hull will be replaced and non-destructive testing will determine the condition of her underwater oak frames. Before the USS Constitution enters Dry Dock No. 1 in the Charlestown Navy Yard in March of this year, the RTC-80130 Series II will have been used to prepare the dock that is also undergoing restoration to bring it up to a condition safe for the ship’s entry. Dry Dock No. 1 opened in 1833 and is the second oldest dry dock in the United States. Twenty-nine new four-foot concrete keel blocks, weighing as much as 15,000 pounds each, will have been positioned on the floor of the dry dock where the ship will rest for her two-and-a-half year restoration period. The maneuverability of the RTC-80130 Series II will allow it to drive around the two sides and head of the 357-foot-long by 100-foot-wide by 32-foot-deep dry dock. The crane has the capacity to reach more than 70 feet out, which will be useful when setting the keel blocks or working in the center of the ship.